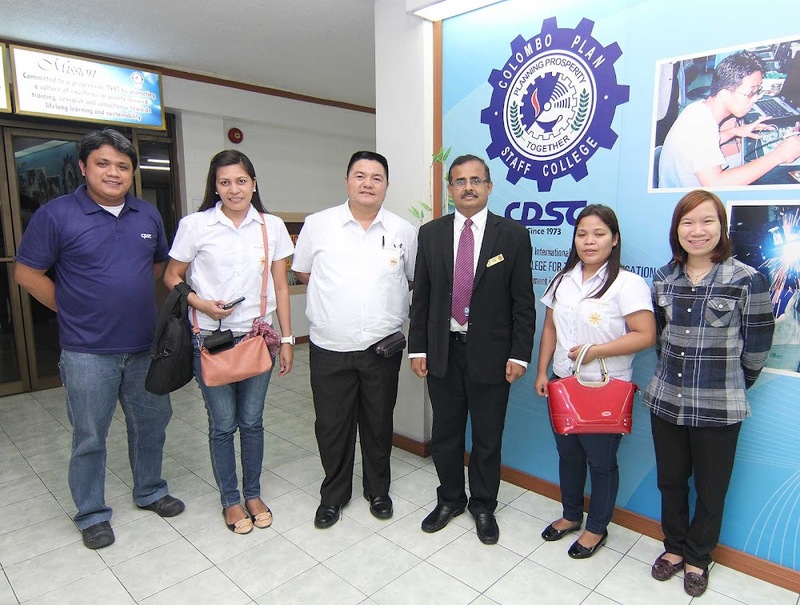 Three school officials from Kananga EDC Institute of Technology (KEITECH) composed of Administrator Mr. Emiliano Saceda II, Head of Management Services, Ms. Vivian Gallardo and Trainer Ms. Elvira Matugas travelled all the way from the province of Leyte, Philippines, to Colombo Plan Staff College in Pasig City on August 14, 2015 to get a better understanding about the Asia Pacific Accreditation and Certification Commission (APACC). Dr. G. Kulanthaivel, Officer-in-Charge of CPSC and APACC, welcomed the guests and delivered a brief presentation about APACC. Before his presentation, he talked about one of the latest developments in APACC, i.e. establishment of the Association of APACC Accreditees (AAA), which aims to promote international mobility in the Asia Pacific Region. He was also pleased to share about the recent onsite visit at TESDA Women’s Center last August 10 – 11, 2015. In his presentation, Dr. GK discussed about the APACC application process and the accreditation validity ranging from Bronze to Gold. He also showed the list of APACC accredited institutions in some member countries, such as the Philippines, Malaysia, Pakistan, Bangladesh and Mongolia and encouraged KEITECH to take on the challenge and apply for accreditation. Mr. Saceda II, responded on a positive note that their institution will prepare for APACC accreditation to improve their services and provide more opportunities for their students and graduates in preparation for the ASEAN integration. Mr. Saceda II also stated that industries should know more about APACC for TVET graduates to have better employment opportunities in various industries.